Ray Bolger (1904–1987), was part of the past of American show business. Born Irish Catholic in Boston, he got his dance education on the streets as a participant in informal tap dancing competitions in which young men worked up routines in imitation of the vaudeville stars of the day. After high school he worked as a bookkeeper for an insurance company, but performing was his calling. After winning some dance competitions, he joined a vaudeville troupe as dancer and supporting comic in the skits. Bolger’s specialty from the beginning was goofy, rubberleg comic dance. Bolger moved up the vaudeville ladder, first as part of a double act with Ralph Sanford, then as a solo performer on the vaudeville circuit. By 1932 he was prominent enough to be Master of Ceremonies at the opening of Radio City Music Hall. The next move was to Broadway, first performing his specialty numbers in revues, then making Broadway history dancing George Balanchine’s choreography for “Slaughter on 10th Avenue” in the 1936 Rodgers and Hart classic, On Your Toes. His Broadway success led to a contract with MGM and his most famous role, the Scarecrow in The Wizard of Oz. When he wasn’t in the theater or on sound stages, Bolger headlined in night clubs across the country. Though for some reason he was exempt from military service, he spent much of World War II entertaining the troops. After the war, Bolger had his greatest Broadway triumph in Frank Loesser’s Where’s Charley? (1948), which was adapted into a successful film musical with Bolger again in the lead. He made a number of film musicals but never became a big star. He didn’t have Gene Kelly’s looks or Fred Astaire’s suavity. He was basically a dancing clown and roles for a performer with his looks and limited talent were rare. The only field left to conquer was television. Bolger’s own show only lasted two seasons, but he made guest appearances on all the major variety shows. By the 1960s, his career was beginning to fade. He didn’t have the acting or singing ability to succeed in the musicals in which he was cast. The shows failed, and Bolger gave up on Broadway. His main source of income was Las Vegas where he was a regular headliner, offering a nostalgic repeat of his most famous numbers. Bolger’s political conservatism and staunch Catholicism didn’t fit with the more liberal mores and anti-establishment politics of artists in the 1960s and beyond. He was a performer with a limited talent and, from middle-age on, he was a purveyor of nostalgia for an older audience. Holly van Leuven has written an exhaustively researched, well-written chronicle of Bolger’s life and career. The book gives us a rich sense of Bolger’s place in various aspects of show business. Like all survivors in that business, Bolger had a keen sense of how to prosper financially. Like most vaudevillians, he had developed a routine that he adapted to different media with mixed success. He was a performer, not an actor. Van Leuven gives the reader a vivid picture of vaudeville in its last days and Broadway in what we now call the “Golden Age.” Many have written about the making of The Wizard of Oz, but van Leuven gives us detailed pictures of the making of Bolger’s Broadway hits and flops. One of the most remarkable aspects of van Leuven’s biography is her presentation of Bolger’s marriage to Gwen Rickard. In the early years of their marriage, Gwen often stayed with her parents while Bolger was touring. Gwen had talent as a script writer and a producer but for the most part had to settle for a career as Bolger’s manager and protector. As van Leuven puts it, “She balanced his checkbooks, washed his special wool socks, and curated his legacy.” In the 1960s, when Bolger’s career wasn’t going as well, Gwen was banned from rehearsals because of her interference. She would present the producer with rewrites and criticize Bolger’s fellow cast members—all to protect her husband who was becoming more insecure. Broadway was moving away from star vehicles but Gwen insisted that Bolger be treated as a star. 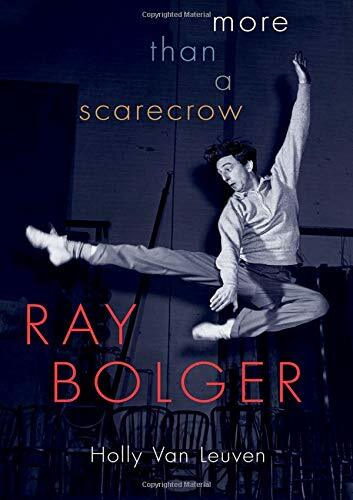 For those of us fascinated with the history of American theater and film, particularly musical theatre, Ray Bolger: More Than a Scarecrow is a must-read. Most people who know Bolger know him only from The Wizard of Oz. That classic is only one chapter in a long, successful career.